City Art Gallery - August 4th - 29th : San Francisco! Valencia street has been changing and its sidewalk is wider and cleaner! Many interesting stores and shops, good restaurants near by the gallery. You should check out the neighbor if you haven't recently! 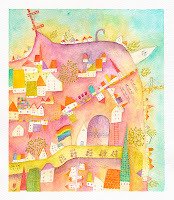 For the August show, Chiyo is showing her San Francisco map series including her new paintings. Please come to the gallery and find out Chiyo's world and also enjoy variety of pieces from the local artists!